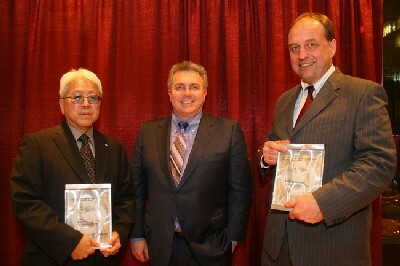 A University of Victoria climate scientist who is working to make weather science more comprehensible to school children and a Simon Fraser University English professor who used his scholarly and creative writing in support of the Japanese Canadian redress movement were honoured on April 11th by receiving this year’s CUFA/BC Distinguished Academics Awards. UVic’s Andrew Weaver was named Academic of the Year for his work in establishing a network of automated weather monitoring stations at Southern Vancouver Island schools (www.victoriaweather.ca ), and for working with a Victoria teacher to prepare extensive curriculum materials to be used by schools in the network. SFU’s Roy Miki received the Career Achievement Award for his part in the successful campaign for redress for Japanese Canadians interned during the Second World War, and for establishing Asian Canadian literature as a legitimate and significant field of academic study. These awards are presented annually to recognise faculty members at BC public universities who use their research and scholarly work to make contributions to the wider community. “Prof. Weaver and Prof. Miki are stellar examples of BC public university faculty who use their considerable knowledge and skills to conduct research and carry out activities that directly contribute to the community beyond the academy,” said Chris Petter, CUFA/BC President. Priya Ramu, host of CBC Radio One’s On the Coast, emceed the awards dinner on Wednesday, April 11th at the Law Courts Inn in Vancouver. The CUFA/BC Distinguished Academics Awards are in their thirteenth year and receive generous support from the University of British Columbia, Simon Fraser University, the University of Victoria, and Royal Roads University. It’s no surprise that this Victoria native is a lead author on the Fourth Assessment Report of the Intergovernmental Panel on Climate Change. With over 150 scholarly articles in print, and another 20 on the way, he is one of the world’s leading authorities on climate change. A fact attested to by his armload of academic awards, and the over $7 million in research funding he has attracted to the University of Victoria. Weaver is not content with studying climate, though-he is also trying to change it. Or rather, he is trying to change public attitudes towards the climate. He has delivered hundreds of keynote addresses, lectures and presentations to technical and non-technical audiences around the world. He is a frequent media commentator and editorialist, and he has advised government officials on climate science. If this weren’t enough, Weaver has given hundreds of hours of his time to the Victoria Weather Network; the project for which he is being recognized with the 2007 CUFA/BC Academic of the Year Award. Since 2005, he and his research team have installed solar-powered weather monitoring stations on more than 70 school rooftops across Southern Vancouver Island. Computers in Weaver’s lab collect data from these stations in real time and make that information available to students and the public through the School-Based Weather Station Network website. Not only does this make weather science more concrete for the students who see their schools listed on TV as the source for current weather conditions, but it also generates those sometimes elusive “teachable moments” that provide educators with the opportunity to touch the minds of their students in profound ways. Weaver has supplemented this work through a cooperative project with Victoria teacher Steven Toleikis to prepare extensive curriculum materials to be used by schools in the monitoring network. In doing so, physics, chemistry and mathematics are given a life outside of the textbooks. Weaver also gives life to these subjects directly through on-going visits to school classrooms and by bringing students and teachers to his lab to learn first hand about the cutting edge of weather and climate science. For his work in engaging the public on climate change issues, for his efforts to make science more exciting and comprehensible to elementary and secondary school students, and for his tireless commitment to bringing science to life for us all, Professor Andrew Weaver received the 2007 CUFA/BC Academic of the Year Award. Social justice and scholarly study of Canadian literature don’t seem to have a lot in common, but Roy Miki has spent his academic career demonstrating that they are much closer than we think. Born on a Manitoba sugar-beet farm that served as an internment camp for Japanese Canadians during the Second World War, Miki’s early experiences with racial discrimination fuelled his desire to express his ideas and emotions, and to create opportunities for others to do so. Miki is credited with almost single-handedly creating the field of Asian Canadian literary studies. His 1998 book, Broken Entries: Race, Subjectivity and Writing, built upon his earlier academic work and the public impact of Joy Kogawa’s 1980 novel Obasan to establish Asian Canadian literature as a legitimate, and important, field of study. Moreover, it was Miki’s 1985 edited collection of the essays and letters of Muriel Kitagawa that Kogawa credited as a source for her novel. These achievements alone may have earned Miki the CUFA/BC Career Achievement Award, but using his scholarship and creative writing in service of the Japanese Canadian redress movement clinched the award. Working alongside his brother and movement leader, Art Miki, Roy took part in the complex and conflictive proceedings leading to the 1988 financial settlement from the federal government for internees and their families. Miki also acted as chronicler of the movement, culminating in his 2004 book Redress: Inside the Japanese Canadian Call for Justice. More than a history of the struggle for redress for the 23,000 Canadians of Japanese descent who were uprooted from the West Coast and dispersed across the country, Miki’s book is also a personal memoir and meditation on what it means to be a Canadian of Japanese descent today. For using his academic work to create opportunities for new voices to enter the canon of Canadian literature, for using his scholarly and creative writing to advance the work of the Japanese Canadian redress movement, and for a lifetime of commitment to social justice, Dr. Roy Miki received the 2007 CUFA/BC Career Achievement Award.